People store all kinds of things on the roofs – kayaks, skis, luggage, off-road recovery equipment, spare water and fuel, and in my case solar panels. Because we are maxing out on solar, we needed a simple, low-key roof rack to hold three panels. I also wanted to be able to attach smaller items such as off-road lights, a shower curtain, an awning, or antennas. I wanted a roof system that allowed for maximum flexibility, low visual impact, gave a finished look, and was relatively easy to install. Weatherguard (https://www.weatherguard.com/en/view/2102-0-01) commercial rails and brackets. This is the least expensive way to get rails on your roof. But I wanted more attachment flexibility for various kinds of things such as awnings, solar panels, etc. than the Weatherguard rails provided. Custom-made rack. Upfitters and local rack companies will make a rack to your specifications out of aluminum or steel. Fairly expensive, but if you’re looking to mount a complex combination of items solar panels and kayaks, or looking to be able to walk on your roof you’ll need to take this approach. My initial thought was I only wanted solar on the roof, and there are number of ways to glue solar directly to the roof without bothering with a rack system. While some have concerns with using VRB for an exterior application like this, amsolar.com has done a many of these installations over the years and never had issues with a bracket coming loose. Impact3d.com roof brackets, with 8020.net aluminum roof rails. I ended up going with this last option. Simple to install, and offered the maximum flexibility for solar, antennas, awnings, or whatever else I wanted to hang off the roof. Although the van is over 19 feet long, it's surprising how little flat space is available on the roof. With the fan in front, there's a total of about 75 to 78 inches available for solar behind. I basically followed Hein’s instructions. 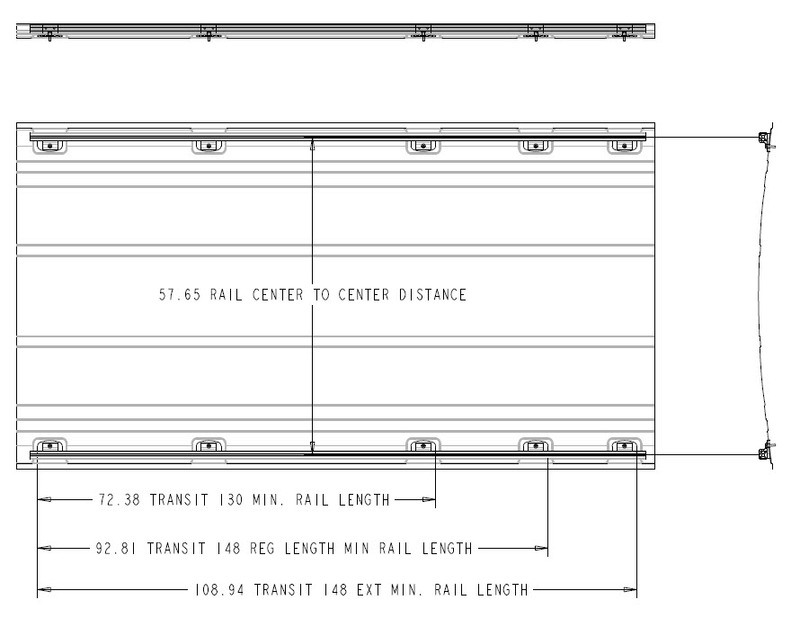 I did buy 102” 8020 1503 series rails from 8020.net, to maximize the rail length and allow me to attach an awning as far forward as possible. for mounting 8020 15 series LS rails to roof of Transit van. 2) Gently pry out roof plugs. Use small screw driver or trim removal tool. Protect the paint if you think you might scratch it. Once plug is out, check to see that threads are accesible and enlarge hole if needed. paint with sand paper. VHB just needs a warm, dry and clean deglossed surface. Do not stick down pads yet. in sliders can be used. become stuck (cross threaded) if not careful starting them. Suggest starting with fingers and then using T handle hex key. position and gently tighten bolts into roof. Mark perimeter of each pad with pencil. placed. Re-verify position and then press down the pads.